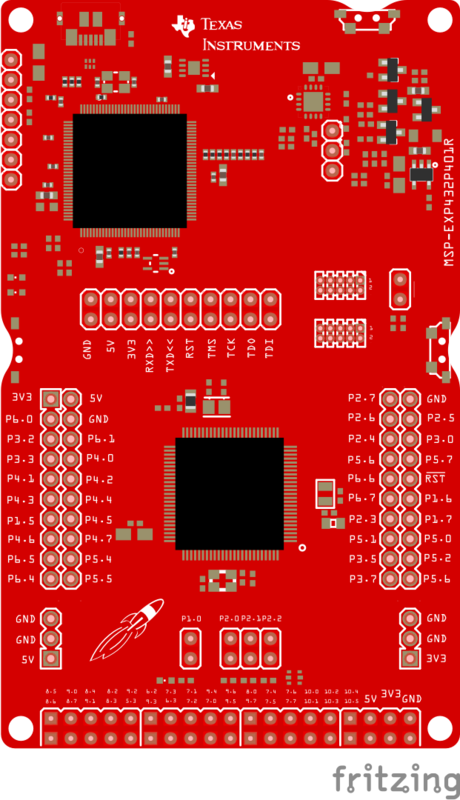 I am looking for someone to make the board from TI named msp432P401R. I am new to fritzing and I googled it to see if someone has already made it, but I was unsuccessful. How is it different than this one (assuming that it is)? to answer my own question they appear to be identical so the corrected part in that thread should do you fine. If you find something that isn’t there then post again. They moved the buttons and added a third pin-header on the bottom. Maybe the dimensions could be the same, so not much effort is necessary. For my part: there are more prioritised projects rightnow. I can’t help you. If I can get Eagle to Fritzing to work (it doesn’t want to work on Windows, so I’ll try Linux) to get a pcb footprint I’ll look at it. The main issue is the position of the extra connectors. I haven’t forgotten about you. I did (with some manual fiddling) get eagle to fritzing to spit out a part. Now I’m post processing that. Breadboard is some 3.3 megabytes in size with 400+ connectors (or which 131 appear useful). It has taken most of the last week to ungroup the breadboard, the size means that Inkscape tends to take 4 to 5 hours (at %40 CPU on 6 of 8 cores on a 3.3gig I7 machine) to ungroup (and there were several hundred groups). It will take more time to sort out the connections and do the other two views I expect. OK, finally finished I hope. As always this was instructive as I hadn’t used eagle to fritzing before. I see a number of issues that need fixing, but I’m not likely to do them any time soon. By and large it does an amazing job, but it has a few issues. In any case here is the part, please report any errors you find.